Boxing faces an "unprecedented risk" and must work to ensure it is not ousted as an Olympic sport, says the head of England Boxing. Gethin Jenkins feels the sport is "starting to wake up to the threat and consequences" of missing Tokyo 2020. The International Olympic Committee (IOC) has threatened the move if amateur boxing's governing body AIBA does not improve internal governance. "In the longer term I think there is a threat to boxing clubs," said Jenkins. "It is grave. I think it's an unprecedented risk in terms of the statements the IOC has made." The AIBA has been asked by the IOC to address its finances, governance and anti-doping issues. The organisation is currently under scrutiny because its interim president Gafur Rakhimov could stand for re-election unopposed to remain in the position. Rakhimov has been described by the US Treasury Department as "one of Uzbekistan's leading criminals", though he denies allegations he is linked with criminal organisations. The only man who could contest the presidency is 1980 Olympic Games silver medallist Serik Konakbayev. His candidacy was turned down on grounds he did not receive adequate votes to be on the ballot paper. But Konakbayev says some of his nomination forms were not counted. He has taken his case to the Court of Arbitration for Sport, who will decide if his candidacy stands by 30 October. The AIBA is expected to announce its president in early November, with the IOC set to update its position on boxing at the 2020 Games in December. "Olympic participation is vital for boxing," added Jenkins. "It's not only from finances directly to the world governing body, it's direct and indirect finances through solidarity payments and by other means to the national federations. "It is key to the sport that we work with the IOC to get the desired outcomes." These are desperate times, with AIBA the reason boxing may be expelled. But this is also grave for the IOC. For all the threats they make about expelling boxing, they realise how important the sport is. Only track and field, out of the other 27 sports, has as many countries represented by the athletes as boxing does. When you look at the Olympic charter, if a sport wants to be part of the schedule, it has to be played by men in 75 countries on four continents. For women it must be played in 40 countries on three continents. Are you really telling me that all of those other sports are played by that many people in that many countries? I would argue they are not. Boxing has this vast, widespread, cosmopolitan representation and that is what the Olympics needs. The greatest fighters for over 50 years - Muhammad Ali, George Foreman, Sugar Ray Leonard, Oscar De La Hoya, Wladimir Klitschko, Anthony Joshua, the list is endless - have appeared at the Olympics, but will it end? Olympic boxing is in grave danger, it is on the ropes. We are just a few weeks away from amateur boxing at the Olympics no longer existing. The top 15 or 20 boxers from the last three Olympics are the ones we are talking about now. If the Olympics no longer has boxing, what will happen to the people in this country whose wages are dependent on funding? The funding only exists because of Olympic boxing. 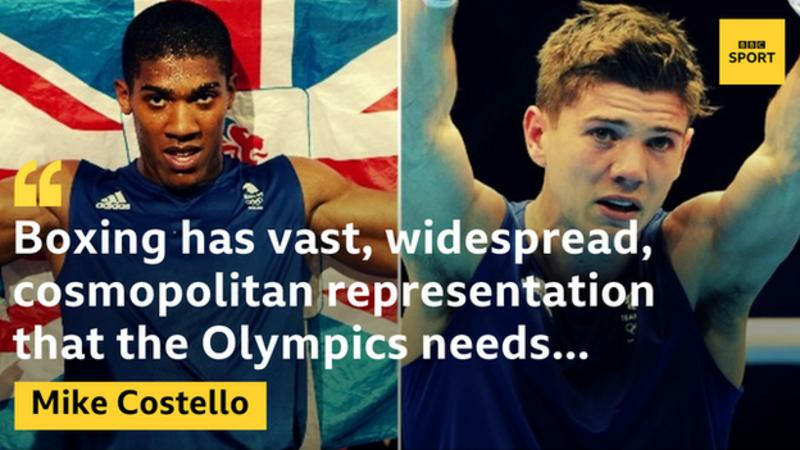 For the four-year Olympic boxing cycle that runs from Rio to Tokyo, GB boxing has been given more than £14m. Medals means money. Compare that to American amateur boxing, where the USA team from 1999 to 2015 were given $14m (£10.6m). You can start to understand money is not the only answer but it is a very important part in funding success.